Saint John Paul II (the Great), Pope - My Catholic Life! Pope Saint John Paul II was a titan. He was as prepared as any man before him to be pope. He was all things—a highly educated European intellectual, a philosophy professor with two Doctorates, a mystic of intense spirituality, a working bishop of a large and dynamic Archdiocese behind the iron curtain, a Cardinal whose counsel was valued by the Pope, an active contributor at the Second Vatican Council, a polyglot, and a world traveler. Adding to this embarrassment of riches, he was an athlete and outdoorsman, had charisma, an open personality, a manly presence, vast circles of lay friends, and was just 58 years old when elected. Never had a conclave of Cardinals made a bolder, wiser choice. That John Paul II was the first Slavic pope, and the first non-Italian in centuries, was interesting. More importantly, however, he was the perfect man for the hour. His long papacy disappointed in almost nothing. The catalogue of accomplishments of John Paul II, both before and after his papal election, is long. He was a tornado of activity and displayed a physical stamina which might have buried a man half his age. He wrote profoundly on every subject: St. Mary, the Trinity, the Church’ social teachings, suffering, Christ, work, moral theology, philosophy, and on and on. Every subject found ample space to spread in his capacious mind. His personal narrative was also compelling. He had personally experienced the effects of the twentieth century’s twin horrors, Nazism and Communism, both efforts to create a perfect society without regard for God or man’s dignity. He knew what it was to be personally degraded, to come close to death, to go into hiding. He had seen his entire nation brought to its knees in humiliation. He understood, at the deepest level, what the Church meant to the world. The papacy of our Saint built on the first steps toward an international Petrine ministry begun by Pope Saint Paul VI and pushed it far beyond. John Paul II said Mass on the altar of the world. Humanity was his congregation. He had the piety of a humble Mexican peasant and the sophistication of a German professor. No one, and no type, was a stranger to him. An assassin’s bullet almost killed him on May 13, 1981, but he survived, barely. The physical effects of his injuries, and other illnesses, made overt his sufferings for all to see. In April 2005 this giant, this father to the world, died as tens of thousands gathered in prayerful vigil outside his window in Saint Peter’s Square. His funeral Mass was timeless and supernatural in a manner felt by all, but difficult to capture in words. He was canonized in 2014 and is buried in Saint Peter’s Basilica. 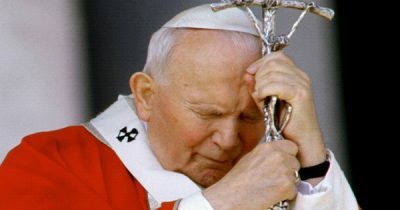 Saint Pope John Paul II, you laid your superabundant gifts on God’s altar as a teen, and God used them to the fullest extent until your death. Help all Christians to put their talents at God’s service to help lead others to Christ and to His Church.